opportunities are not just for entrepreneurs and Fortune 500 companies: Making Good shows step-by-step how any person can achieve financial autonomy, capitalize on global changes to infrastructure, and learn from everyday success stories—providing the skills and insights this generation needs to succeed and build careers and lives of consequence. like Vanity Fair, Salon, and Rolling Stone as the voices of their generation. They are at the vanguard of figuring out how the next generation will rethink, reimagine, and rebuild the world around us. Making Good culls the knowledge that has allowed Billy and Dev to build thriving, meaningful careers into a book that will be What Color Is Your Parachute? for the Facebook generation. DEV AUJLA is the Founder of DreamNow, a charitable organization that works with young people to develop, fund and implement their social change projects. Dev works as a Director of Partnerships for Change.org and has worked for other leading companies that do good and pay well like GOOD Corps. His work and writing have been featured in numerous media outlets including the Globe and Mail, CBC Newsworld and the Huffington Post. Aujla divides his time between Toronto and New York. BILLY PARISH is widely known as an innovative youth organizer, social entrepreneur, and champion of the emerging green economy. He co-founded the Energy Action Coalition, the largest youth advocacy organization in the world working on climate change issues, is co-founder and President of Solar Mosaic, a solar energy marketplace and serves on numerous non-profit and clean-tech boards. Parish lives in Oakland, California with his wife and daughters. “A manifesto and map for a generation desperate for jobs. 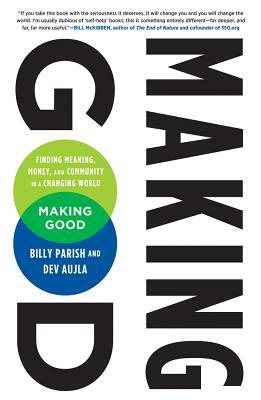 Making Good shows readers not so much how they can find any old job, but more how you can create a career path that can generate meaning, purpose and money.” —Bill Drayton, founder and CEO of Ashoka, founder of Get America Working!